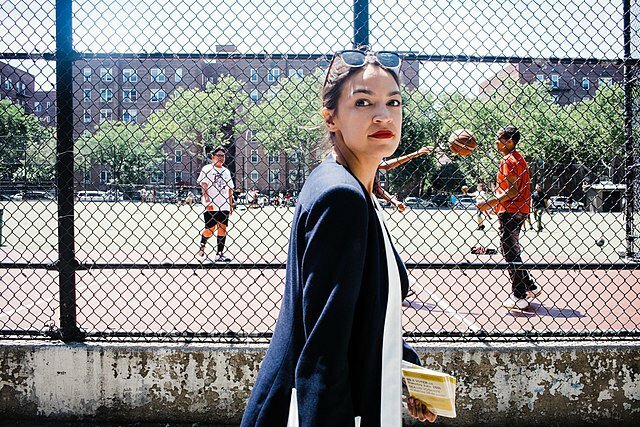 Alexandria Ocasio-Cortez canvasses in Sunnyside, Queens on June 26th, 2018. Credit: Corey Torpie/Wikimedia Commons. CC BY-SA 4.0. In March of this year, 18-year-old South Floridian Emma Gonzalez announced that she was “Cuban and bisexual” in the midst of her battle for stronger gun controls following the Valentine’s Day shootings at Stoneman Douglas High School. A few months later, 28-year-old Alexandria Ocasio Cortez claimed a working-class, Puerto Rican identity during her successful challenge to the Democratic Caucus Chair, Joe Crowley, clearing the way for her to represent the Bronx and Queens in the US Congress. These young women were asserting an intersectional identity that is easily recognized by many of their millennial generation peers but unfamiliar to many others: after years of debate within the Latino community they became emblematic of “Latinx,” a new identifying label that is rapidly taking hold among millennials, Latino activists and advocacy groups, and academics. In a political climate marred by the continuing ascendance of authoritarian, nativist politics embodied by the Trump presidency, Latinx may be able to create a wealth of political capital by embracing a fluid, multiracial and multicultural identity. And this might stimulate a more effective reaction to Trumpian rhetoric which uses the phrase “America First” as a code to further anti-immigrant scapegoating, reaching sordid new lows with the separation and detention of over 12,000 immigrant children from their families in 2018. The advent of the term Latinx is the most recent iteration of a naming debate that is grounded in the politics of race and ethnicity. For several decades the term ‘Latino’ was the progressive choice over the European-ethnic sounding ‘Hispanic,’ carrying with it the notion that Latin American migrants to the United States were not merely hyphenated Europeans but products of mixed-race societies and cultures. When many of us first see the word in print, Latinx can seem strange and unpronounceable, but after closer inspection it appears liberating and futurist. Just as identifying as Latino represented an attempt to defy America’s black/white racial binary, Latinx defies conventional gender conformity by defying the male/female gender binary. As far as I know, Latinx is the first attempt by a racial and/or ethnic group to make a statement about emerging issues of gender identification. When political figures like Ocasio Cortez, González, and other emerging candidates like Julia Salazar openly tout their multiple identifications alongside progressive policies, they are representing a new form of intersectional politics (Salazar recently won her Democratic Primary for State Senator in New York and identifies as Colombian and Jewish, though not without controversy). Pioneered by African American feminist projects led by the Cohambee River Collective in the 1970s and coined by legal scholar Kimberlé Williams Crenshaw as well as the Chicana “border thinking” feminism of Gloria Anzadúa and Cherrie Moraga, intersectionalism seems like a fitting antidote to a political landscape in crisis over the conflict between neoliberalism and nativist authoritarianism. Even before the ascension of Trump, community organizers and street demonstrations were trying to promote a message that Black Lives Matter, the Women’s Movement and the Sanctuary Cities movement to protect the rights of the undocumented were intersecting causes that should be joined together. So it wasn’t that much of a surprise that the demonstrations that were held at JFK airport in early 2017 against Trump’s Muslim Travel Ban were organized by a coalition of Jewish and Muslim groups and featured a multiracial cross-section of New Yorkers. For Latin American descendants, multiracial identity is, to varying degrees, ‘cooked into’ their varying national cultures. Raza, the Spanish word for race, is often used to designate a collective identity that is itself a mixture of races. Prominent Mexican scholar José Vasconcelos’ essay La Raza Cósmica tried to celebrate mixture as a path to transcendence beyond racism, but in many ways it only served to privilege European identity at the expense of indigenous culture. For many Latinx in the US, the harsh reality of the black-white racial binary they confront as immigrants is a wake-up call that in many cases reinforces their solidarity with their roots as marginalized people. This was manifested most clearly in the 1970s among Puerto Rican migrants in New York, whose embrace of African roots informed cultural and political movements, and in the West, where Mexican Americans came to identify as ‘Chicanos,’ a name derived from their indigenous ancestors in Mexico and the Southwestern USA. While dormant for much of the last 30 years, these new multicultural and intersectional forms of identity are gaining in prominence, and they represent a kind of synergy between people of color and white millennials whose dampened economic prospects have led them to embrace class politics. Much of Ocasio Cortez and Salazar’s support comes from neighborhoods in Queens with an increasing millennial demographic. The two women are both members of Democratic Socialists of America, a group favored by politically-aware millennials which stresses class politics and socialist solutions to social problems. Yet the case of Latinx also argues against the supposed dichotomy between class-based politics and so-called identity politics. Much of the debate among progressives following the Trump election centered on whether Republicans were more successful in appealing to class-based politics through their critiques of free trade agreements and the loss of jobs overseas, as opposed to the Democrats’ perceived focus on identity politics rooted in Obama’s victory. Latinx and other marginalized groups are large constituencies that are affected by growing global inequality as much as, if not more than, the white working class. “Women like me aren’t supposed to run for office,” says Ocasio-Cortez in her now-famous campaign video depicting her ties to working-class Bronx. “I wasn’t born to a wealthy or powerful family. I was born in a place where your zip code determines your destiny.” For all of the critique recently leveled at her for posing in an Interview magazine photo shoot wearing thousands of dollars of designer clothing, Ocasio-Cortez is practicing the politics of recognition. She is asking to be recognized, not only as a woman of color—the object of both racial and sexual discrimination—but also as part of the struggling 99 per cent: central to her platform is an increase in the minimum wage, universal health care, affordable housing, criminal justice reform, immigration reform, confronting climate change and campaign-finance reform. It's this politics of recognition that Francis Fukuyama attacks in his new book, Identity: The Demand for Dignity and the Politics of Resentment. For Fukuyama, the claim to difference, whether it’s Black Lives Matter, gay marriage, Osama Bin Laden or Vladimir Putin, is the ultimate threat to the new liberal order established by the fall of the Soviet Union in 1989. For him, this form of identity politics is a kind of misplaced passion somewhere between desire and reason. Latinx does represent something in between, a way of thinking that moves in and around borders, but on that journey it retains memories and moments of everywhere it travels. It’s a politics of recognition that not only brings to light the unrepresented and the marginalized, but also sees many forms of marginalization existing in one person. For that reason, the new politics it represents, defined by mulitiracial and multicultural awareness and inclusive of gender difference, is not the end of history but a new beginning. Ed Morales’ new book is Latinx: The New Force in American Politics and Culture.